Remember when you saw this advert and realised that foundation adverts can be incredibly beautiful - well you were right. I saw this advert, did my research and decided that this foundation was for me. 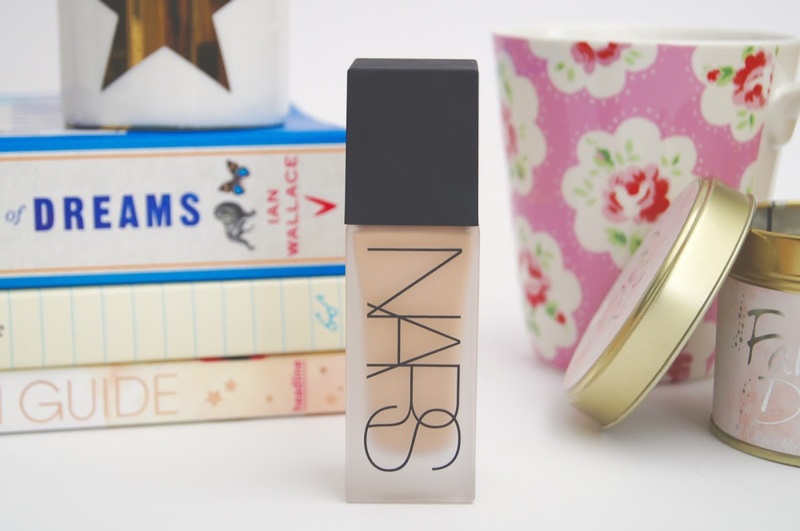 The Nars All Day Luminous Weightless Foundation has a tongue-twister of a name but definitely represents all of these qualities. I've been trying this out for over a month now and, since it is my first foundation (I know, shock-horror), I am super impressed. Here's my review and it's long. 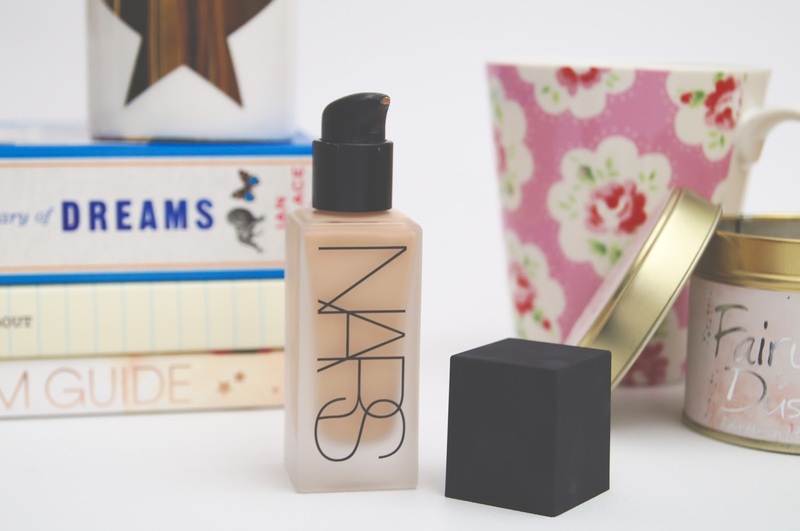 Packaging - From the Nars Sheer Glow foundation, this packaging is a big improvement. It has its own built in pump (it looks like the Nars Gods were finally listening to our wishes) so there is not need to buy a separate one. Now, I don't know if it's just my pump that does this, but it does leak a tiny bit which means it needs wiping with a damp cloth every so often. Also, with the lid being matte plastic, any traces of foundation on your fingers passes onto it and sticks; it's not too easy to wipe off either. Otherwise, the cuboid, frosted glass bottle is gorgeous. I'd say it's very suitable with the no-messing-around quality. With the bottle being glass, you have to handle it with care, it's too precious to break. Value - I'm not going to pretend that this was cheap - it certainly wasn't. I paid £32 which is very expensive for a foundation but this is a high-end product and you do get what you pay for. Because this foundation has been formulated carefully and comes in precise shades, the price really is worth it. You only need a small amount, just a little blob can go a long way meaning this will last you a while. Application - I apply this by pumping one pump on the back of my hand, dabbing blobs around my face (focusing on areas of redness), using the Real Techniques foundation brush to spread it around my face then finishing by using my RT buffing brush to really smooth everything out and blend. I will buff for a while and the results are very soft. It is easy to apply but I have found that buffing is essential to eliminate any streaky marks. Otherwise it leaves a flawless, medium-coverage finish. It's also very buildable for even more coverage. Consistency - One big annoying factor I find, is that it does not sit well on the driest parts of my skin (e.g. the tip and bridge of my nose). It looks blotchy on these areas so I no longer apply it there. I wouldn't say it is bad for dry skin because I do have quiet dry skin, I would say it just doesn't tolerate rough skin. For these areas I think I will have to invest in a primer (feel free to recommend primers in the comments) or maybe just focus on moisturising those places on the days when I'll be wearing this foundation. The overall consistency is runny but, personally, that doesn't bother me. Colour - My shade is Mont Blanc. I tried all different colours at my local Nars counter and we found that this was the perfect shade for me. It was a very close call between this and Gobi which was a bit more yellow. I'm super impressed with the colour match and the lady at the Nars counter was very helpful and patient when helping me choose a shade. All Day? Luminous? Weightless? - Sort of, yes and yes! All day is exaggerating, but I feel like it would vary across skin types. Personally, I find it needs powdering across the day and does seem to wear off by the end. It's certainly luminous because it does make me look radiant and definitely not dull. I'm mostly comfortable with agreeing with the weightlessness of this on my face. I can't feel it on my face, which is always my biggest fear with foundation. There's nothing worse that the heavy feeling of cake-y makeup on your face and this lies lightly on my skin with no bother. Overall, I have completely fallen in love with this foundation and would recommend it in a flash. Which foundation do you use? Let me know in the comments. 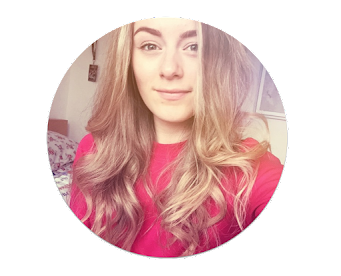 This was such a good review Alice! Nars seems like such a good company, I'll have to check them out sometime soon. I don't wear too much/no makeup, usually just a little bit of mascara because I feel like I bit of a clown if I have a whole face of makeup on! I do like lipsticks though, would you recommend any Nars lipsticks?